Best grown in consistently moist, fertile, organically-rich, well-drained loams in full sun. Runner beans are perennials in frost-free climates, but die to the ground at first fall frost in temperate climates where they are grown as annuals. Plants may be propagated by seed started indoors in pots about 4-6 weeks before last spring frost date, but most gardeners prefer planting seed outdoors in the ground at the last spring frost date. Plants grown as vegetables are typically planted in rows for growing up poles, stakes or tripods, but they may be grown in a variety of additional ways where appreciation of the flowers is desired. Flower production is usually abundant even in hot summer climates, with flowering continuing until first fall frost. Bean production is best in cool summer climates, and may lag in hot summer temperatures. Consistent moisture throughout the growing season is important. Pick beans when ripe to encourage new flowers. 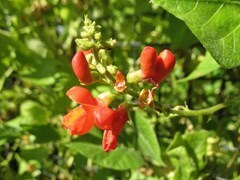 Phaseolus coccineus, commonly known as runner bean or scarlet runner bean, is a twining perennial vine in the pea family which is commonly grown as an annual. It is native to the mountains of Central America. It is the one species in this genus which is grown both as a vegetable food plant for its edible pods (green beans) and seeds (fresh or dried beans) and/or as an ornamental plant for appreciation of its showy flowers. Flowers (addition to salads) and young leaves (pot herb) are also edible. This vine can easily reach 8-12’ tall in a single season. Loose clusters of 1 1/4” long scarlet pea-like flowers bloom from early summer to frost on stems to 8” long from the leaf axils. Leaves are trifoliate, with each leaf having three broad-ovate leaflets to 3-5” long. Beans are delicious when young (3-5” long), but if left on the vine will eventually develop into large tough pods to 1.5’ long. Runner bean (British term) is basically the same thing as a pole bean (American term) in that both do basically the same thing, namely, climb and produce edible beans. Runner beans produce flowers about 4-5 weeks after planting of the seed, with first harvest in 60-75 days. Picking the beans encourages production of additional flowers. In addition to being handsome ornamental climbers, runner beans also attract hummingbirds, butterflies and bees. Runner beans twine clockwise whereas most other types of beans twine counterclockwise. Annual for vegetable gardens. Ornamental for supports on a sunny porch or split rail fence, or train on tripods, trellises or pergolas in more formal garden areas. Containers.